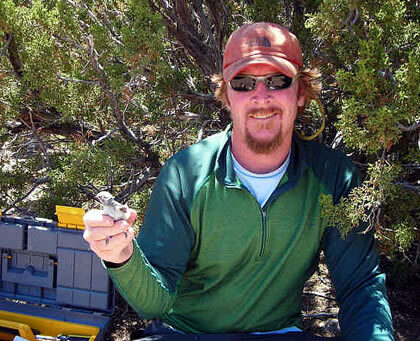 John is co-principal and senior project manager of Animas Biological Studies (ABS) and serves as lead biologist for raptor research and monitoring projects. John has a B.A. in Economics from Northwestern University and an M.A. and PhD (abd) in American Studies from St. Louis University. He has over 15 years of experience as a field biologist with a variety of taxa, recently with an emphasis on diurnal raptors. Prior to launching ABS, John worked as an environmental consultant in Durango for 9 years, where he conducted field studies for a variety of wildlife research and monitoring projects and authored hundreds of Biological and Environmental Assessments. Prior to working as a consultant, John worked for Round River Conservation Studies (Salt Lake City, UT) where he served as director of the San Juan Grizzly Bear (Ursus arctos horribilis) Project in southwest Colorado and conducted prey-base and habitat suitability studies for the Mexican Gray Wolf (Canis lupus baileyi) Reintroduction Project in Arizona. John has many years of experience conducting U.S. Fish and Wildlife Service protocol surveys for the federally endangered southwestern willow flycatcher (Empidonax traillii extimus) and least Bell’s vireo (Vireo bellii pusillus), federally threatened Mexican spotted owl (Strix occidentalis lucida) and desert tortoise (Gopherus agassizii), and federal candidate yellow-billed cuckoo (Coccyzus americanus). He has extensive experience monitoring nests and conducting behavioral studies for Mexican spotted owls. John’s experience with other species specific surveys includes lesser prairie chicken (Tympanuchus pallidicinctus), Merriam’s wild turkey (Meleagris gallopavo merriami), mountain plover (Charadrius montanus) and gray vireo (Vireo vicinior). He served as a member of the New Mexico Gray Vireo Recovery Plan Advisory Committee and is currently a member of the New Mexico Gray Vireo Recovery Team, sponsored by New Mexico Department of Game and Fish. He is skilled in general avian survey techniques including distance sampling and variable circular plots and has years of experience with nest searching and monitoring for passerines and near-passerines. He also has extensive experience with vegetative surveys and sampling techniques, including noxious weed surveys, wetland vegetation monitoring, and forest cover plots. In addition to John's experience as a field biologist, he has also published a number of essays and articles on natural history and conservation. Prior to her positions at ABS and FLC, Lynn worked for 5 years as an environmental consultant in Durango and 1 year as the Songbird Monitoring Coordinator for Hawks Aloft, Inc. (Albuquerque, New Mexico). For both positions, she was the lead biologist and project manager for a variety of passerine and near-passerine surveys and nest monitoring projects, raptor surveys and nest monitoring, U.S. Fish and Wildlife Service protocol surveys for the federally endangered southwestern willow flycatcher (Empidonax traillii extimus) and threatened Mexican spotted owl (Strix occidentalis lucida), and presence/absence surveys for the federal candidate yellow-billed cuckoo (Coccyzus americanus) and the then federal proposed mountain plover (Charadrius montanus). As a consultant, Lynn authored hundreds of technical documents in support of the Endangered Species Act (Biological Assessments) and National Environmental Policy Act (Environmental Assessments/Environmental Impact Statements). 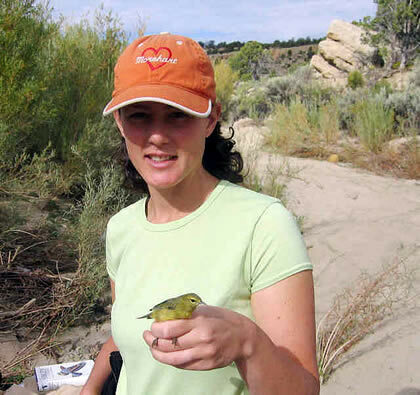 In 2006-07, Lynn also obtained grant funds and executed a study estimating density of and developing a habitat model for gray vireo (Vireo vicinior) in the San Juan Basin natural gas field in New Mexico. She served as a key member of New Mexico Department of Game and Fish’s (NMDGF) Gray Vireo Recovery Plan Development Team and is currently a member of the Gray Vireo Recovery Team. Lynn is co-principal and senior project manager of Animas Biological Studies (ABS) and serves as lead biologist for research and monitoring projects for passerine birds. She has over 15 years of experience as an avian ecologist, with a particular expertise in reproductive ecology of Neotropical migratory birds. She has a B.S. in Wildlife Biology from Colorado State University and an M.S. in Biology from Arkansas State University and is skilled in current techniques in avian research and monitoring including project design, field methodologies, and bio-statistics. Lynn has been successful at procuring hundreds of thousands of dollars in grants for avian research projects and has been published in peer-reviewed journals. She currently holds a Master Bird Banding Permit for passerines and near-passerines from the U.S. Geological Survey Bird Banding Laboratory. Lynn also has experience with vegetative sampling and with trapping and marking small and medium-sized mammals, amphibians and reptiles. In addition to her involvement with ABS, Lynn is also employed as a research associate for the San Juan Institute of Natural and Cultural Resources at Fort Lewis College (FLC) where she is the state-wide project manager for the second Colorado Breeding Bird Atlas. As an M.S. candidate at Arkansas State University, Lynn obtained funding for and directed a 2-year research project comparing nesting success of early successional passerine birds in regenerating forests subjected to two silvicultural treatments and evaluated postfledging survival and habitat use of yellow-breasted chats (Icteria virens). She received the 2002 Outstanding Graduate Student Award from Arkansas State University. Prior to entering graduate school, Lynn worked as a field research assistant for passerine research at Louisiana State University, Colorado State University, University of Idaho and University of Rhode Island.